Aerial Port Competition - Aerial port teams ensure equipment and supplies are loaded safely and quickly for airdrop or transport. Combat endurance course. Five-person team will work together to negotiate an obstacle course consisting of 21 obstacles. (Required event - all teams). 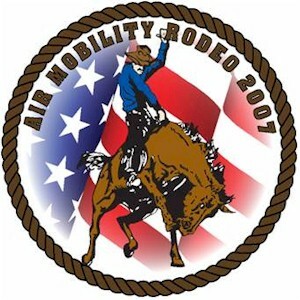 Aeromedical Evacuation (AE) Competition (Five member teams compete in three events). Aeromedical Mission (Contingency Flight). AE teams will fly a contingency flight aboard dedicated AE competition C-130 aircraft; for international teams so equipped, the C-160 will be used. This event will last approximately five hours and will include all aspects of AE contingency operations from preflight to post-flight. Teams will be required to fly in contingency gear (helmet, body armor, but no flak vest). Aeromedical Mission (Static Configuration). AE teams will conduct a static configuration event aboard dedicated AE competition C-17/KC-135 aircraft; for international teams so equipped, the C-160 will be used. This event will last approximately three hours and will include limited AE operations from preflight to before take-off duties. Litter Endurance Course. This 30-minute event consists of the proper assessment and treatment of combat casualties, negotiation of obstacles during casualty retrieval, and the use of proper body mechanics. Airdrop (C-130, C-17 and T-1). Goal is to evaluate all aspects of a crew's ability to delivery an airdrop load, on target, on time. Crews are scored on accurately identifying low level route turn points, timing to the drop zone, and accuracy for three different airdrops: personnel, container delivery system, and heavy equipment loads. One airdrop will be conducted using night vision goggles. T-1s will fly only one, day low level route and complete a simulated airdrop. Short Field Landing (C-17, C-130 and C-160). Aircraft attempt to make a smooth, consistent approach to land precisely in the center of a 500 foot landing zone. Points are also given for taking off at the proper speed, smooth approach and landing without bouncing. Backing/Combat Offload (C-17, C-130 and C-160). Goal is to evaluate all aspects of a crew's ability to quickly, safely and smoothly back the aircraft into a minimum size ramp area and conduct a combat offload. Crews are scored on commencing the event at the approved time, and for expediency in the ground ops area (penalties are assessed for excessive time spent in the ground operations area). Points are also lost for departing a simulated minimum width taxiway surface while positioning for the combat offload, positioning the aircraft too far back or too far forward in relation to a reference line, if the pallet's final position is too far forward of the reference line and for procedural or safety deviations, or for failing to bring the aircraft to a smooth stop within the designated combat offload distance. Aerial Refueling (KC-10, KC-135, C-5, C-17 and T-1). Both aircraft work together to transfer 10,000 pounds of fuel with 20 minutes of toggle time in a 20 minute period. Points are lost for early or late arrival at the air refueling control point, for every second of toggle time under 20 minutes and for each time the refueling boom is disconnected. Instrument Approach (KC-10, KC-135, C-5, OSA and T-1). Goal is to fly as precise and instrument approach as possible. Crews will be scored on course guidance, speed, altitude control, and approach planning. Joint airdrop inspection (JAI): Static load inspection of two faulty heavy equipment loads and four faulty container delivery system loads. Tanker Cargo Loading. (KC-10, KC-135). Teams of KC-10 and KC-135 aircrew members, including a second boom operator, are evaluated on handling cargo in three areas -- preparation, loading/unloading and mission paperwork. Preflight. Maintenance competition aircraft are inspected for compliance with - 6 work cards or international rules for maintenance pre-flight. Aircraft must be in operations order-specified configuration, with required maintenance records and forms documentation available for review. Post-flight Inspection. Umpires evaluate maintenance team's basic post-flight inspection for compliance with -6 work cards or international rules. Inspection must be accomplished within three hours after block-in. Fueling. Ground refueling operations are evaluated for compliance within weapon system job guides or international ground refueling rules. Teams have 1 hour to establish fuel flow into aircraft. Combat tactics. SFs demonstrate the ability to execute a close-in security plan for a mobility aircraft parked at a simulated austere airfield. Combat endurance course. SF participants face 23 obstacles on a 2K course followed by a cross-country run. The team completing the course in the fastest time wins the event. Combat weapons. This event tests a team's ability to engage targets over rough terrain using both the M874 shotgun and M9 pistol. The course includes both pop-up and steel targets.